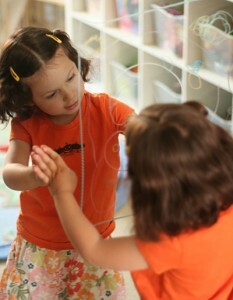 The girls and I have been having so much fun playing with Lyra Wax-O-Glas Window Crayons. I am really having to restrain myself from covering every bit of window and mirror in our house with notes and drawings! Before I let the girls use them, I tested how easy they were to clean off the window. I am happy to report that I was able to rub-off the crayon with a dry towel (or my finger…). Any residue left behind came off easily with water and/or glass cleaner. Then, let them make their own masterpieces on the playroom closet doors. 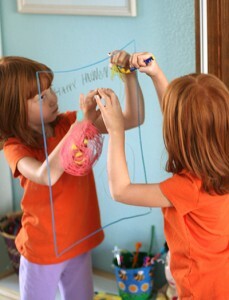 I drew a picture frame for each of them — I really didn’t want the entire mirror covered in scribbles! They loved working with the window crayons and spent a good 30 minutes drawing and having fun! And it makes for really cute pictures! Oooohhh, I want to try these! Our family loves window markers, but I’ve never seen the window crayons. I get frustrated when the markers run out of juice, so that would be a definite perk for the crayons! Oh, how cute! Much better than those stinky window markers. Love it! I love these! I already have too much on O’s Christmas list, but I’m definitely going to put these on her birthday wish list!